This guide covers getting up and running with Ruby on Rails. How to install Rails, create a new Rails application, and connect your application to a database. The general layout of a Rails application. The basic principles of MVC (Model, View, Controller) and RESTful design. How to quickly generate the starting pieces of a Rails application. This guide is designed for beginners who want to get started with a Rails application from scratch. It does not assume that you have any prior experience with Rails. Be aware that some resources, while still excellent, cover versions of Ruby as old as 1.6, and commonly 1.8, and will not include some syntax that you will see in day-to-day development with Rails. Rails is a web application development framework written in the Ruby programming language. It is designed to make programming web applications easier by making assumptions about what every developer needs to get started. It allows you to write less code while accomplishing more than many other languages and frameworks. Experienced Rails developers also report that it makes web application development more fun. Rails is opinionated software. It makes the assumption that there is a "best" way to do things, and it's designed to encourage that way - and in some cases to discourage alternatives. 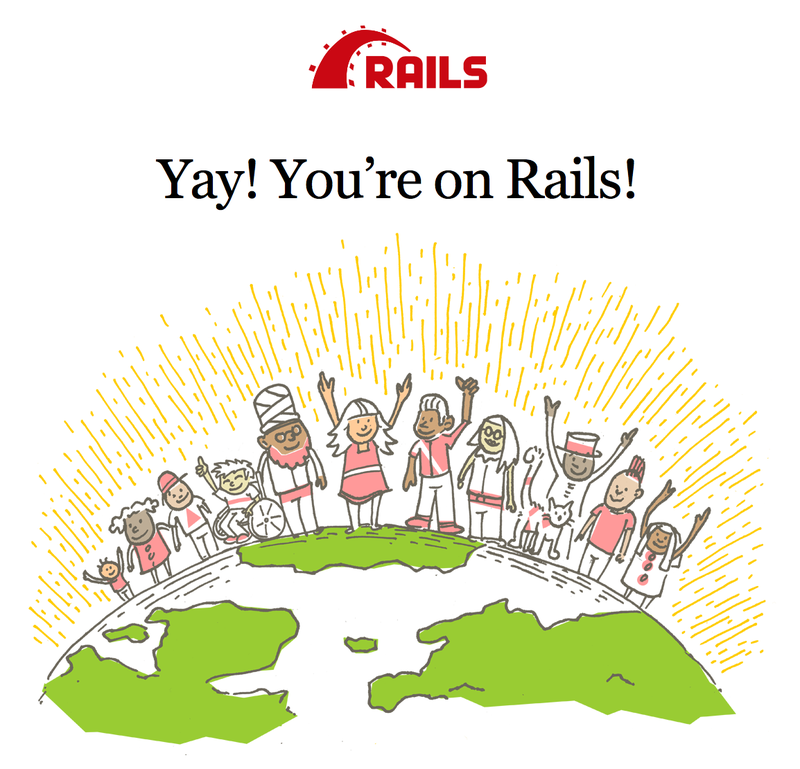 If you learn "The Rails Way" you'll probably discover a tremendous increase in productivity. If you persist in bringing old habits from other languages to your Rails development, and trying to use patterns you learned elsewhere, you may have a less happy experience. Don't Repeat Yourself: DRY is a principle of software development which states that "Every piece of knowledge must have a single, unambiguous, authoritative representation within a system." By not writing the same information over and over again, our code is more maintainable, more extensible, and less buggy. Convention Over Configuration: Rails has opinions about the best way to do many things in a web application, and defaults to this set of conventions, rather than require that you specify minutiae through endless configuration files. The best way to read this guide is to follow it step by step. All steps are essential to run this example application and no additional code or steps are needed. By following along with this guide, you'll create a Rails project called blog, a (very) simple weblog. Before you can start building the application, you need to make sure that you have Rails itself installed. Before you install Rails, you should check to make sure that your system has the proper prerequisites installed. These include Ruby and SQLite3. Rails requires Ruby version 2.2.2 or later. If the version number returned is less than that number, you'll need to install a fresh copy of Ruby. A number of tools exist to help you quickly install Ruby and Ruby on Rails on your system. Windows users can use Rails Installer, while macOS users can use Tokaido. For more installation methods for most Operating Systems take a look at ruby-lang.org. If you are working on Windows, you should also install the Ruby Installer Development Kit. The program should report its version. If it says something like "Rails 5.2.1", you are ready to continue. Rails comes with a number of scripts called generators that are designed to make your development life easier by creating everything that's necessary to start working on a particular task. One of these is the new application generator, which will provide you with the foundation of a fresh Rails application so that you don't have to write it yourself. This will create a Rails application called Blog in a blog directory and install the gem dependencies that are already mentioned in Gemfile using bundle install. If you're using Windows Subsystem for Linux then there are currently some limitations on file system notifications that mean you should disable the spring and listen gems which you can do by running rails new blog --skip-spring --skip-listen. You can see all of the command line options that the Rails application builder accepts by running rails new -h.
app/ Contains the controllers, models, views, helpers, mailers, channels, jobs and assets for your application. You'll focus on this folder for the remainder of this guide. bin/ Contains the rails script that starts your app and can contain other scripts you use to setup, update, deploy or run your application. config/ Configure your application's routes, database, and more. This is covered in more detail in Configuring Rails Applications. config.ru Rack configuration for Rack based servers used to start the application. For more information about Rack, see the Rack website. db/ Contains your current database schema, as well as the database migrations. Gemfile.lock These files allow you to specify what gem dependencies are needed for your Rails application. These files are used by the Bundler gem. For more information about Bundler, see the Bundler website. lib/ Extended modules for your application. package.json This file allows you to specify what npm dependencies are needed for your Rails application. This file is used by Yarn. For more information about Yarn, see the Yarn website. public/ The only folder seen by the world as-is. Contains static files and compiled assets. Rakefile This file locates and loads tasks that can be run from the command line. The task definitions are defined throughout the components of Rails. Rather than changing Rakefile, you should add your own tasks by adding files to the lib/tasks directory of your application. README.md This is a brief instruction manual for your application. You should edit this file to tell others what your application does, how to set it up, and so on. test/ Unit tests, fixtures, and other test apparatus. These are covered in Testing Rails Applications. tmp/ Temporary files (like cache and pid files). vendor/ A place for all third-party code. In a typical Rails application this includes vendored gems. .gitignore This file tells git which files (or patterns) it should ignore. See GitHub - Ignoring files for more info about ignoring files. .ruby-version This file contains the default Ruby version. To begin with, let's get some text up on screen quickly. To do this, you need to get your Rails application server running. If you are using Windows, you have to pass the scripts under the bin folder directly to the Ruby interpreter e.g. ruby bin\rails server. To stop the web server, hit Ctrl+C in the terminal window where it's running. To verify the server has stopped you should see your command prompt cursor again. For most UNIX-like systems including macOS this will be a dollar sign $. In development mode, Rails does not generally require you to restart the server; changes you make in files will be automatically picked up by the server. The "Welcome aboard" page is the smoke test for a new Rails application: it makes sure that you have your software configured correctly enough to serve a page. To get Rails saying "Hello", you need to create at minimum a controller and a view. A controller's purpose is to receive specific requests for the application. Routing decides which controller receives which requests. Often, there is more than one route to each controller, and different routes can be served by different actions. Each action's purpose is to collect information to provide it to a view. A view's purpose is to display this information in a human readable format. An important distinction to make is that it is the controller, not the view, where information is collected. The view should just display that information. By default, view templates are written in a language called eRuby (Embedded Ruby) which is processed by the request cycle in Rails before being sent to the user. Rails will create several files and a route for you. Most important of these are of course the controller, located at app/controllers/welcome_controller.rb and the view, located at app/views/welcome/index.html.erb. Now that we have made the controller and view, we need to tell Rails when we want "Hello, Rails!" to show up. In our case, we want it to show up when we navigate to the root URL of our site, http://localhost:3000. At the moment, "Welcome aboard" is occupying that spot. Next, you have to tell Rails where your actual home page is located. Open the file config/routes.rb in your editor. root 'welcome#index' tells Rails to map requests to the root of the application to the welcome controller's index action and get 'welcome/index' tells Rails to map requests to http://localhost:3000/welcome/index to the welcome controller's index action. This was created earlier when you ran the controller generator (bin/rails generate controller Welcome index). Launch the web server again if you stopped it to generate the controller (bin/rails server) and navigate to http://localhost:3000 in your browser. You'll see the "Hello, Rails!" message you put into app/views/welcome/index.html.erb, indicating that this new route is indeed going to WelcomeController's index action and is rendering the view correctly. For more information about routing, refer to Rails Routing from the Outside In. Now that you've seen how to create a controller, an action and a view, let's create something with a bit more substance. In the Blog application, you will now create a new resource. A resource is the term used for a collection of similar objects, such as articles, people or animals. You can create, read, update and destroy items for a resource and these operations are referred to as CRUD operations. If you run bin/rails routes, you'll see that it has defined routes for all the standard RESTful actions. The meaning of the prefix column (and other columns) will be seen later, but for now notice that Rails has inferred the singular form article and makes meaningful use of the distinction. It will look a little basic for now, but that's ok. We'll look at improving the styling for it afterwards. A controller is simply a class that is defined to inherit from ApplicationController. It's inside this class that you'll define methods that will become the actions for this controller. These actions will perform CRUD operations on the articles within our system. There are public, private and protected methods in Ruby, but only public methods can be actions for controllers. For more details check out Programming Ruby. This error indicates that Rails cannot find the new action inside the ArticlesController that you just generated. This is because when controllers are generated in Rails they are empty by default, unless you tell it your desired actions during the generation process. You're getting this error now because Rails expects plain actions like this one to have views associated with them to display their information. With no view available, Rails will raise an exception. ArticlesController#new is missing a template for this request format and variant. request.formats: ["text/html"] request.variant:  NOTE! For XHR/Ajax or API requests, this action would normally respond with 204 No Content: an empty white screen. Since you're loading it in a web browser, we assume that you expected to actually render a template, not… nothing, so we're showing an error to be extra-clear. If you expect 204 No Content, carry on. That's what you'll get from an XHR or API request. Give it a shot. That's quite a lot of text! Let's quickly go through and understand what each part of it means. The first part identifies which template is missing. In this case, it's the articles/new template. Rails will first look for this template. If not found, then it will attempt to load a template called application/new. It looks for one here because the ArticlesController inherits from ApplicationController. The next part of the message contains request.formats which specifies the format of template to be served in response. It is set to text/html as we requested this page via browser, so Rails is looking for an HTML template. request.variant specifies what kind of physical devices would be served by the response and helps Rails determine which template to use in the response. It is empty because no information has been provided. Therefore the file should be called articles/new.html.erb and needs to be located inside the app/views directory of the application. When you refresh http://localhost:3000/articles/new you'll now see that the page has a title. The route, controller, action and view are now working harmoniously! It's time to create the form for a new article. If you refresh the page now, you'll see the exact same form from our example above. Building forms in Rails is really just that easy! When you call form_with, you pass it an identifying scope for this form. In this case, it's the symbol :article. This tells the form_with helper what this form is for. 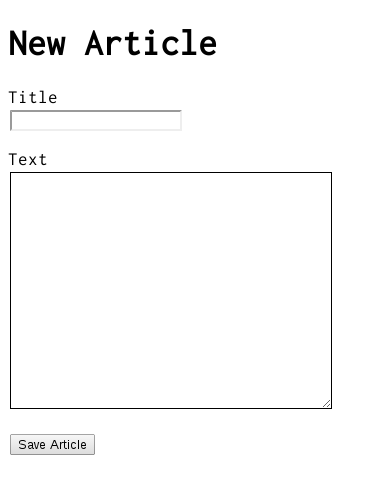 Inside the block for this method, the FormBuilder object - represented by form - is used to build two labels and two text fields, one each for the title and text of an article. Finally, a call to submit on the form object will create a submit button for the form. There's one problem with this form though. If you inspect the HTML that is generated, by viewing the source of the page, you will see that the action attribute for the form is pointing at /articles/new. This is a problem because this route goes to the very page that you're on right at the moment, and that route should only be used to display the form for a new article. The form needs to use a different URL in order to go somewhere else. This can be done quite simply with the :url option of form_with. Typically in Rails, the action that is used for new form submissions like this is called "create", and so the form should be pointed to that action. The articles_path helper tells Rails to point the form to the URI Pattern associated with the articles prefix; and the form will (by default) send a POST request to that route. This is associated with the create action of the current controller, the ArticlesController. You now need to create the create action within the ArticlesController for this to work. By default form_with submits forms using Ajax thereby skipping full page redirects. To make this guide easier to get into we've disabled that with local: true for now. If you re-submit the form now, you may not see any change on the page. Don't worry! This is because Rails by default returns 204 No Content response for an action if we don't specify what the response should be. We just added the create action but didn't specify anything about how the response should be. In this case, the create action should save our new article to the database. The render method here is taking a very simple hash with a key of :plain and value of params[:article].inspect. The params method is the object which represents the parameters (or fields) coming in from the form. The params method returns an ActionController::Parameters object, which allows you to access the keys of the hash using either strings or symbols. In this situation, the only parameters that matter are the ones from the form. Ensure you have a firm grasp of the params method, as you'll use it fairly regularly. Let's consider an example URL: http://www.example.com/?username=dhh&email=dhh@email.com. In this URL, params[:username] would equal "dhh" and params[:email] would equal "dhh@email.com". This action is now displaying the parameters for the article that are coming in from the form. However, this isn't really all that helpful. Yes, you can see the parameters but nothing in particular is being done with them. With that command we told Rails that we want an Article model, together with a title attribute of type string, and a text attribute of type text. Those attributes are automatically added to the articles table in the database and mapped to the Article model. Rails responded by creating a bunch of files. For now, we're only interested in app/models/article.rb and db/migrate/20140120191729_create_articles.rb (your name could be a bit different). The latter is responsible for creating the database structure, which is what we'll look at next. Active Record is smart enough to automatically map column names to model attributes, which means you don't have to declare attributes inside Rails models, as that will be done automatically by Active Record. As we've just seen, bin/rails generate model created a database migration file inside the db/migrate directory. Migrations are Ruby classes that are designed to make it simple to create and modify database tables. Rails uses rake commands to run migrations, and it's possible to undo a migration after it's been applied to your database. Migration filenames include a timestamp to ensure that they're processed in the order that they were created. The above migration creates a method named change which will be called when you run this migration. The action defined in this method is also reversible, which means Rails knows how to reverse the change made by this migration, in case you want to reverse it later. When you run this migration it will create an articles table with one string column and a text column. It also creates two timestamp fields to allow Rails to track article creation and update times. For more information about migrations, refer to Active Record Migrations. Rails will execute this migration command and tell you it created the Articles table. Because you're working in the development environment by default, this command will apply to the database defined in the development section of your config/database.yml file. If you would like to execute migrations in another environment, for instance in production, you must explicitly pass it when invoking the command: bin/rails db:migrate RAILS_ENV=production. Here's what's going on: every Rails model can be initialized with its respective attributes, which are automatically mapped to the respective database columns. In the first line we do just that (remember that params[:article] contains the attributes we're interested in). Then, @article.save is responsible for saving the model in the database. Finally, we redirect the user to the show action, which we'll define later. You might be wondering why the A in Article.new is capitalized above, whereas most other references to articles in this guide have used lowercase. In this context, we are referring to the class named Article that is defined in app/models/article.rb. Class names in Ruby must begin with a capital letter. As we'll see later, @article.save returns a boolean indicating whether the article was saved or not. Rails has several security features that help you write secure applications, and you're running into one of them now. This one is called strong parameters, which requires us to tell Rails exactly which parameters are allowed into our controller actions. Why do you have to bother? The ability to grab and automatically assign all controller parameters to your model in one shot makes the programmer's job easier, but this convenience also allows malicious use. What if a request to the server was crafted to look like a new article form submit but also included extra fields with values that violated your application's integrity? They would be 'mass assigned' into your model and then into the database along with the good stuff - potentially breaking your application or worse. For more information, refer to the reference above and this blog article about Strong Parameters. If you submit the form again now, Rails will complain about not finding the show action. That's not very useful though, so let's add the show action before proceeding. The special syntax :id tells rails that this route expects an :id parameter, which in our case will be the id of the article. As we did before, we need to add the show action in app/controllers/articles_controller.rb and its respective view. A frequent practice is to place the standard CRUD actions in each controller in the following order: index, show, new, edit, create, update and destroy. You may use any order you choose, but keep in mind that these are public methods; as mentioned earlier in this guide, they must be placed before declaring private visibility in the controller. A couple of things to note. We use Article.find to find the article we're interested in, passing in params[:id] to get the :id parameter from the request. We also use an instance variable (prefixed with @) to hold a reference to the article object. We do this because Rails will pass all instance variables to the view. With this change, you should finally be able to create new articles. Visit http://localhost:3000/articles/new and give it a try! Now if you go to http://localhost:3000/articles you will see a list of all the articles that you have created. You can now create, show, and list articles. Now let's add some links to navigate through pages. The link_to method is one of Rails' built-in view helpers. It creates a hyperlink based on text to display and where to go - in this case, to the path for articles. This link will allow you to bring up the form that lets you create a new article. If you want to link to an action in the same controller, you don't need to specify the :controller option, as Rails will use the current controller by default. In development mode (which is what you're working in by default), Rails reloads your application with every browser request, so there's no need to stop and restart the web server when a change is made. There isn't much to this file - but note that the Article class inherits from ApplicationRecord. ApplicationRecord inherits from ActiveRecord::Base which supplies a great deal of functionality to your Rails models for free, including basic database CRUD (Create, Read, Update, Destroy) operations, data validation, as well as sophisticated search support and the ability to relate multiple models to one another. These changes will ensure that all articles have a title that is at least five characters long. Rails can validate a variety of conditions in a model, including the presence or uniqueness of columns, their format, and the existence of associated objects. Validations are covered in detail in Active Record Validations. The new action is now creating a new instance variable called @article, and you'll see why that is in just a few moments. Notice that inside the create action we use render instead of redirect_to when save returns false. The render method is used so that the @article object is passed back to the new template when it is rendered. This rendering is done within the same request as the form submission, whereas the redirect_to will tell the browser to issue another request. A few things are going on. We check if there are any errors with @article.errors.any?, and in that case we show a list of all errors with @article.errors.full_messages. pluralize is a rails helper that takes a number and a string as its arguments. If the number is greater than one, the string will be automatically pluralized. The reason why we added @article = Article.new in the ArticlesController is that otherwise @article would be nil in our view, and calling @article.errors.any? would throw an error. Rails automatically wraps fields that contain an error with a div with class field_with_errors. You can define a css rule to make them standout. We've covered the "CR" part of CRUD. Now let's focus on the "U" part, updating articles. This time we point the form to the update action, which is not defined yet but will be very soon. Passing the article object to the method, will automagically create url for submitting the edited article form. This option tells Rails that we want this form to be submitted via the PATCH HTTP method which is the HTTP method you're expected to use to update resources according to the REST protocol. The arguments to form_with could be model objects, say, model: @article which would cause the helper to fill in the form with the fields of the object. Passing in a symbol scope (scope: :article) just creates the fields but without anything filled into them. More details can be found in form_with documentation. The new method, update, is used when you want to update a record that already exists, and it accepts a hash containing the attributes that you want to update. As before, if there was an error updating the article we want to show the form back to the user. We reuse the article_params method that we defined earlier for the create action. It is not necessary to pass all the attributes to update. 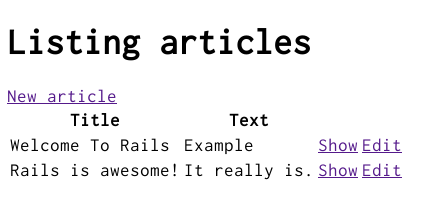 For example, if @article.update(title: 'A new title') was called, Rails would only update the title attribute, leaving all other attributes untouched. Our edit page looks very similar to the new page; in fact, they both share the same code for displaying the form. Let's remove this duplication by using a view partial. By convention, partial files are prefixed with an underscore. You can read more about partials in the Layouts and Rendering in Rails guide. Everything except for the form_with declaration remained the same. The reason we can use this shorter, simpler form_with declaration to stand in for either of the other forms is that @article is a resource corresponding to a full set of RESTful routes, and Rails is able to infer which URI and method to use. For more information about this use of form_with, see Resource-oriented style. You can call destroy on Active Record objects when you want to delete them from the database. Note that we don't need to add a view for this action since we're redirecting to the index action. Finally, add a 'Destroy' link to your index action template (app/views/articles/index.html.erb) to wrap everything together. Congratulations, you can now create, show, list, update and destroy articles. In general, Rails encourages using resources objects instead of declaring routes manually. For more information about routing, see Rails Routing from the Outside In. It's time to add a second model to the application. The second model will handle comments on articles. This is very similar to the Article model that you saw earlier. The difference is the line belongs_to :article, which sets up an Active Record association. You'll learn a little about associations in the next section of this guide. The (:references) keyword used in the bash command is a special data type for models. It creates a new column on your database table with the provided model name appended with an _id that can hold integer values. To get a better understanding, analyze the db/schema.rb file after running the migration. Each comment belongs to one article. One article can have many comments. These two declarations enable a good bit of automatic behavior. For example, if you have an instance variable @article containing an article, you can retrieve all the comments belonging to that article as an array using @article.comments. For more information on Active Record associations, see the Active Record Associations guide. This creates comments as a nested resource within articles. This is another part of capturing the hierarchical relationship that exists between articles and comments. For more information on routing, see the Rails Routing guide. Like with any blog, our readers will create their comments directly after reading the article, and once they have added their comment, will be sent back to the article show page to see their comment now listed. Due to this, our CommentsController is there to provide a method to create comments and delete spam comments when they arrive. 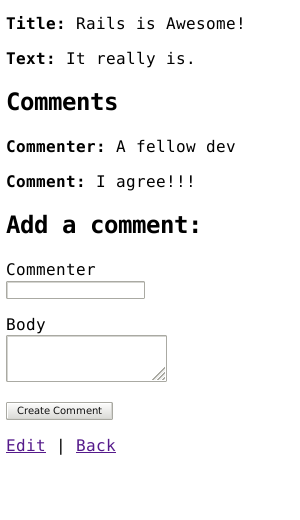 This adds a form on the Article show page that creates a new comment by calling the CommentsController create action. The form_with call here uses an array, which will build a nested route, such as /articles/1/comments. You'll see a bit more complexity here than you did in the controller for articles. That's a side-effect of the nesting that you've set up. Each request for a comment has to keep track of the article to which the comment is attached, thus the initial call to the find method of the Article model to get the article in question. In addition, the code takes advantage of some of the methods available for an association. We use the create method on @article.comments to create and save the comment. This will automatically link the comment so that it belongs to that particular article. Once we have made the new comment, we send the user back to the original article using the article_path(@article) helper. As we have already seen, this calls the show action of the ArticlesController which in turn renders the show.html.erb template. This is where we want the comment to show, so let's add that to the app/views/articles/show.html.erb. Now you can add articles and comments to your blog and have them show up in the right places. Now that we have articles and comments working, take a look at the app/views/articles/show.html.erb template. It is getting long and awkward. We can use partials to clean it up. This will now render the partial in app/views/comments/_comment.html.erb once for each comment that is in the @article.comments collection. As the render method iterates over the @article.comments collection, it assigns each comment to a local variable named the same as the partial, in this case comment which is then available in the partial for us to show. The second render just defines the partial template we want to render, comments/form. Rails is smart enough to spot the forward slash in that string and realize that you want to render the _form.html.erb file in the app/views/comments directory. The @article object is available to any partials rendered in the view because we defined it as an instance variable. Another important feature of a blog is being able to delete spam comments. To do this, we need to implement a link of some sort in the view and a destroy action in the CommentsController. The destroy action will find the article we are looking at, locate the comment within the @article.comments collection, and then remove it from the database and send us back to the show action for the article. If you were to publish your blog online, anyone would be able to add, edit and delete articles or delete comments. 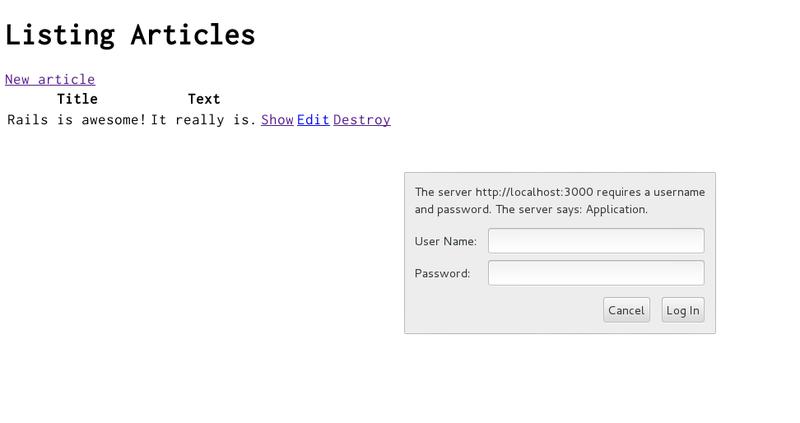 Rails provides a very simple HTTP authentication system that will work nicely in this situation. In the ArticlesController we need to have a way to block access to the various actions if the person is not authenticated. Here we can use the Rails http_basic_authenticate_with method, which allows access to the requested action if that method allows it. Other authentication methods are available for Rails applications. Two popular authentication add-ons for Rails are the Devise rails engine and the Authlogic gem, along with a number of others. Security, especially in web applications, is a broad and detailed area. Security in your Rails application is covered in more depth in the Ruby on Rails Security Guide. Now that you've seen your first Rails application, you should feel free to update it and experiment on your own. The easiest way to work with Rails is to store all external data as UTF-8. If you don't, Ruby libraries and Rails will often be able to convert your native data into UTF-8, but this doesn't always work reliably, so you're better off ensuring that all external data is UTF-8. If you have made a mistake in this area, the most common symptom is a black diamond with a question mark inside appearing in the browser. Another common symptom is characters like "Ã¼" appearing instead of "ü". Rails takes a number of internal steps to mitigate common causes of these problems that can be automatically detected and corrected. However, if you have external data that is not stored as UTF-8, it can occasionally result in these kinds of issues that cannot be automatically detected by Rails and corrected. Your text editor: Most text editors (such as TextMate), default to saving files as UTF-8. If your text editor does not, this can result in special characters that you enter in your templates (such as é) to appear as a diamond with a question mark inside in the browser. This also applies to your i18n translation files. Most editors that do not already default to UTF-8 (such as some versions of Dreamweaver) offer a way to change the default to UTF-8. Do so. Your database: Rails defaults to converting data from your database into UTF-8 at the boundary. However, if your database is not using UTF-8 internally, it may not be able to store all characters that your users enter. For instance, if your database is using Latin-1 internally, and your user enters a Russian, Hebrew, or Japanese character, the data will be lost forever once it enters the database. If possible, use UTF-8 as the internal storage of your database.